If HUMMER had a theme song, it’d probably be the Allman Brothers’ Whipping Post — the one that goes “Sometimes I feel, sometimes I feel, like I been tied to the whipping post…” The brand has been the go-to effigy when something needs to burn on the altar of eco desecration. But HUMMER doesn’t have a theme song, it has the tagline “Like No Other.” It also has a new pick-em-up truck we had the chance to drive recently in the High Sierras: the H3T. Follow the jump to find out if it’s another HUMMER like no other, and check out the gallery of hi-res images below. 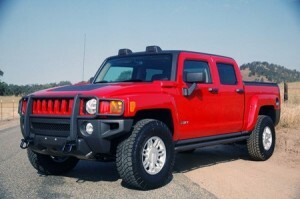 Before we get into the truck, we’ll spare a few more words for the HUMMER brand itself. GM is openly considering selling it to companies from China and India, is in talks with dealers about an amicable breakup, and is amenable to turning the brand’s lights off and sending everyone home. In July, HUMMER’s sales were down 65-percent. This year, HUMMER sales are down 30.7% overall, but non-US sales are up 28.7%. Apparently, in the rest of the world, nymphs swim in rivers of milk and honey, gas prices are up to two songs and a dance, and the lure of the big chrome H is still strong. And GM is hoping it that lure will be even stronger with the H3T. The H3T is square in the mid-size truck range — a little longer than a Chevrolet Colorado and a little shorter than a Dodge Dakota. From the B-pillar forward it’s an H3 and has the same I-5 and V8 engines. An instant advantage over the H3 is the full-size rear door, meaning no highly attentive sideways entries are required to get behind the front seats. It’s got plenty roomy, but although HUMMER says the rear bench is good for three people, we wouldn’t want to be the guy in the middle for a long haul. But underneath and out back, it is its own beast. It has a bedliner with built in storage and a highly flexible cargo management system built right in. There are four underbody skid shields. Standard equipment also includes Hill Start Assist, Traction Control, Electronic Stability Control, three recovery hooks, and Bluetooth connectivity. The 5-cylinder H3T will run you $30,750, with the Alpha version going for about $5K more. Throw down for the Adventure Package at an additional $2,570, and you get a 4:03:01 transfer case, electric front and rear locking differentials, tuned shocks out back, and 33-inch Bridgestone tires. There’s a Luxury Package for the 5-cylinder that gets you the leather goodies and stereo from the Alpha, and there’s an X package that adds chrome and shiny bits, too. If you’re thinking of buying a HUMMER then you should be thinking about gas mileage. We’ll fill you in: the I-5 is EPA-rated at 14/18 and the V8 is rated 13/16. Both vehicles have a combined rating of 16 mpg, which is the same as the Wrangler, Commander, Touareg, and Tacoma. For the first time you also can get the H3 Alpha with a cloth interior. However, the cloth is applied to the bolsters. The center seating panels are a mesh-like material, which looks good and is damn comfy. And despite the heat, we never stuck to it. HUMMER’s quirky rear-view camera no longer slides out of the mirror housing. The camera image now shows up directly on the left side of the mirror face itself. We only had a look at it once, and in bright light it could take a second to orient your eyes to the lack of contrast, but for our money it’s a much more graceful arrangement than the previous pop-out version. The rear-vision camera is a $550 option… after you buy the tow package, which is a $420 option. We started off in the 5-cylinder manual. On city streets and highways, the truck is fine. As has been said often enough, it doesn’t have a lot of power â€“ I think “anemic” has been hurled at it once or twice â€“ but once up to speed, there’s nothing wrong with it. On the flats, at least. Head up a steep incline, as we did making our way up to the trailhead, and the engine turns into that guy at the gym whose moaning lets everyone know how hard he’s working. We were told that the sweet spot for power is about 4,500 RPM, but by the time you get up there, engine noise is filling the cabin. It wasn’t awful â€“ and in fact, by the end of the day we still would have stumped for the 5-cylinder â€“ but a well placed turbo would do wonders for it. 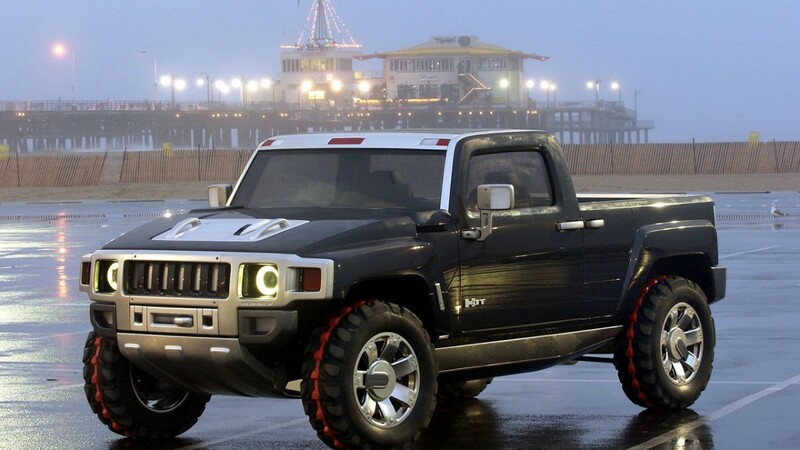 HUMMER says it can tow 4,400 pounds, but we don’t even want to imagine what that would be like. Once at the trailhead, things got better. The folks in charge said they picked out a tight technical trail at the upper end of the amateur level. Every fourth boulder had been tagged by some unfortunate underbody or defaced with rubber tread graffiti, and nearly every tree had sacrificed a pound of bark to other trucks’ grille guards and mirrors. When not trying to drag itself up steep hills, the 5-cylinder is AOK. The truck has plenty of power to get up and over rocks, aided by those 33-inch Adventure Package tires. The electronic locking front diff, which was called into use a couple of times, was effective at getting the truck over or through anything on the trail. Even when we picked the wrong line, there was an occasional crunch on the rock guards, but the truck simply plowed on. Speaking of plowing on, yours truly missed the part of the H3T walkaround that explained the 4:1 low gear. Our last manual off-roader was an ’86 Trooper II, which was unstoppable but liked the throttle to help it get over serious stuff. Not so with the H3T. Unaware of this, we soon filled the woods with the smell of burning clutch. We’ll be signing autographs at the trailhead, folks, please hold your applause. A gentle talking to clued us in to the 4:1, and then we simply let the truck meander over the rocks on its own. It would bog on occasion, but wouldn’t quit. You could apply a dash of throttle or you could let the truck tiptoe over on its own. A half mile using that technique, and we could smell nature again. On the way back down, we swapped out for the automatic H3T Alpha, which we found was the equivalent of fire-and-forget. Put the truck in Drive, and pick a good line. Every once in a while you might put the truck in first gear, or low-range, and then go back to… letting it go. No questions. No drama. There’s really not much more to say. Just stay alive. And steer. HUMMER has made its bread and its bed by providing a certain kind of vehicle for a certain kind of person. Fill in any blanks you want. The H3T looks like a HUMMER, there’s a big V8 and leather on offer, it’s aimed at men, in stock form it will go nearly anywhere you point it, and there are enough accessories to make Barbie and Ken faint. If you just want a pickup truck, go somewhere else. If you want a pickup truck that says something and can do nearly anything, well, there isn’t much else out there. It’s not for everyone, and, as even HUMMER will tell you, that’s the point. We’ll start finding out how many midsize pickup people HUMMER can get to join its party in September, when the truck arrives on dealer lots. If we were invited, we’d still take the 5-cylinder manual, give it a little under-the-hood help, and be on our way.